Where is the Hope-Hill Neighborhood? 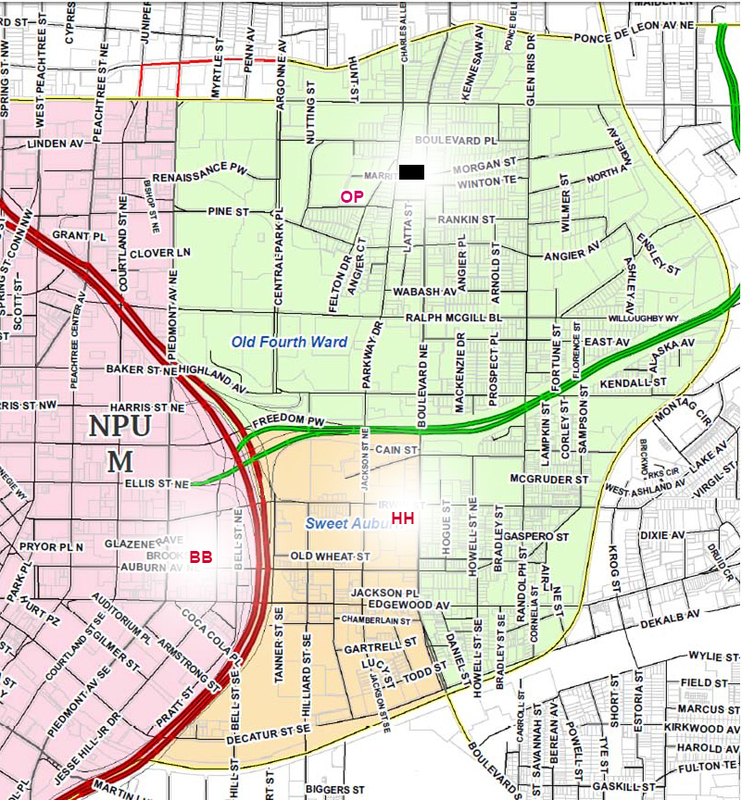 This map, at a slightly different scale, shows the “Old Fourth Ward” and other inner city Atlanta districts that make up the Hope-Hill neighborhood. Our third partner, Big Bethel AME Saturday School, located on Auburn Avenue, is shown as “BB.” Hope-Hill (“HH”) and Operation P.E.A.C.E. (“OP”) also appear on the map. 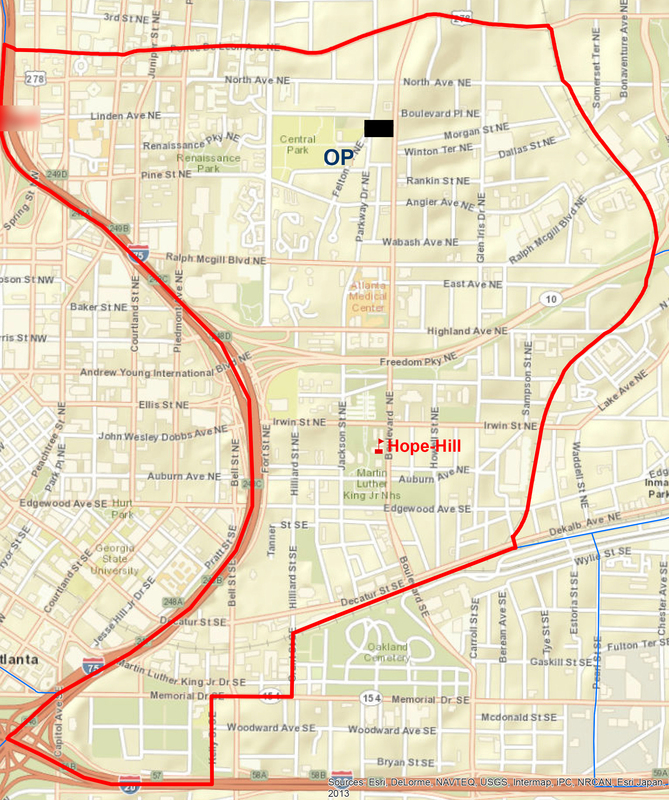 There are corners of worse crime and pockets of denser poverty in Atlanta than Boulevard, but this street is notorious because it literally connects Atlanta’s haves and have-nothings while figuratively tracing a century of disconnect between the city’s polished image and the messy reality of misguided public policies. With all its challenges, the neighborhood is gentrifying, as anticipated by the 2008 Old Fourth Ward Master Plan. Still, deep pockets of poverty remain. The median annual income of families living in the Bedford Pines community is $3,000. Located next to the Visitor Center at the MLK Jr. National Historic Site, Hope-Hill Elementary School (and its predecessor, John Hope Elementary) has been UUCA’s main educational partner for over two decades. The school serves about 400 students. More than 90 percent are African-American, while most of the remainder are Hispanic. The students come from varied economic backgrounds, but many have low incomes, and well over 90 percent are entitled to free or reduced price meals. Many, though not all, of the students are academically challenged, particularly in math. Around half of the third graders fail to “meet expectations” in math on standardized tests—though that percentage decreases by the time they leave the school. In 2014 21 percent of fifth graders failed math, down from 28 percent the preceding year. Reading is a problem too. Many Hope-Hill students enter kindergarten with a much smaller vocabulary than the average child in America. Miraculously, though, by fifth grade only ten percent failed the standardized reading test. (That’s the 2014 figure, down from a much higher 25 percent in 2013). For many years, UUCA has been a consistent advocate for the students of Hope-Hill. In the past few years, thanks in part to UUCA’s advocacy, an increasing number of local residents and other nonprofit partners have deepened their involvement with the school. Under the steadfast and trusted leadership of Executive Director [now actively retired, but still heavily involved] Ms. Edna Moffett, since 1995 Operation P.E.A.C.E. has been a dynamic agent of change in an otherwise neglected community. Operation P.E.A.C.E began as an effort to improve the lives of the children in the Old Fourth Ward community. In addition to serving as a buffer between the neighborhood children and the negative forces at work in the community, the organization has evolved into the primary community resource for residents looking for solutions to their problems. Operation P.E.A.C.E. also operates a Summer Academy, also free to parents, offers academics, fun, food, and safety during the summer months. During the summer of 2014 UUCA volunteers taught art and science and assisted in a variety of other ways. Operation P.E.A.C.E. is located at 386 Pine Street, in a building owned by the Atlanta Public Schools and leased to the Kindezi School, a charter school. Parking is available on the street. A good place to park is Merritts Street, which runs behind the school. Walk around to the front door, and identify youself as an Operation P.E.A.C.E. volunteer. The space that Operation P.E.A.C.E. has subleased is marked with a sign, to your right after you enter the school’s front door. UUCA members serve as volunteers and support the Saturday School in a variety of other ways. Big Bethel Saturday School is located on Auburn Avenue, a few doors to the west of Big Bethel AME Church. A sign clearly identifies it. Parking is available in the large parking lot behind the church. The entrance to the parking lot is on John Wesley Dobbs. Volunteers park free, with a Big Bethel decal.